Check your polling status (Electoral Roll) online and via SMS. The upcoming 14th Malaysian General Election GE14 2018 (Pilihanraya Umum ke-14 PRU 14) is getting closer. If you are a registered voter, then make a smart move to avoid future complications - check the status of your voter’s registration and your polling location. You can do it right now and it’s very easy. 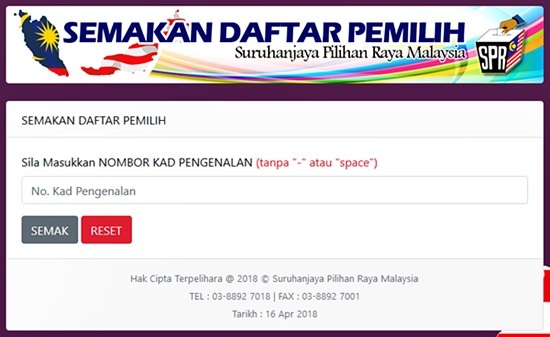 The Election Commission of Malaysia - EC (Suruhanjaya Pilihan Raya Malaysia -SPR) has provided a website that enables anyone to check the verified Electoral Roll online. Enter the voter’s identity card number into the text field provided. Enter the captcha, the click “SEMAK” button. The details provided in the result include the voter’s locality, polling district, parliamentary and state seats, polling center and channel (saluran). When election time comes, be a model citizen -VOTE!